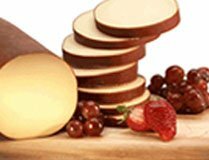 Australian Gouda cheese originated from Netherlands, typically made from pasteurised cow’s milk. Some varieties of Gouda cheese use sheep’s or goat’s milk. Gouda is slightly sweet and buttery flavoured cheese with a smooth and firm texture. It maybe used as dessert cheese.